(NaturalNews) As cleanup crews gear themselves up to begin the treacherous task of removing 400 tons of spent fuel from the Fukushima Daiichi Reactor No. 4 in the coming weeks, reports continue to flood in showing that radiation from the stricken plant is still causing major environmental damage all over the world. Particularly on the West Coast of the U.S., a multitude of strange animal deaths, high radiation readings and other recent anomalies suggest that the Fukushima disaster is far from over. It is simply ludicrous, in other words, for anyone to suggest at this point that these Fukushima woes are dwindling, as fresh evidence suggests that quite the opposite is true. A recent report by Michael Snyder over at TheTruthWins.com highlights 28 signs that the U.S. West Coast is still being torn up by nuclear radiation from Fukushima. Many of these signs include strange illnesses and mass deaths among sea creatures and other animals, as well as high radiation readings from dozens of monitoring stations. "Every single day, 300 tons of radioactive water from Fukushima enters the Pacific Ocean," writes Snyder about this one major sign. "That means that the total amount of radioactive material released from Fukushima is constantly increasing, and it is steadily building up in our food chain." Another obvious sign is the recent mass migration of radioactive debris the size of California across the Pacific Ocean. BBC News in the U.K. reported last year that literally millions of tons of radioactive debris had begun traveling across the Pacific Ocean, and that some of it had already impacted Hawaii and even the West Coast. There has also been a series of strange animal deaths recently, including masses of sea lions, sockeye salmon and other sea creatures washing up on the shore. Many of the polar bears, seals and walruses observed along the Alaska coastline have also been found to have major fur loss and open sores, both of which are indicative of radiation poisoning. "Look at what's going on now: They're dumping huge amounts of radioactivity into the ocean -- no one expected that in 2011," stated Daniel Hirsch, a nuclear policy lecturer at the University of California-Santa Cruz recently to Global Security Newswire. "We could have large numbers of cancer from ingestion of fish." There will most certainly be a major uptick in cancer rates due to the Fukushima incident, as the Japan Meteorological Agency's Meteorological Research Institute estimates that some 60 billion becquerels of radioactive cesium and strontium are being dumped into the Pacific Ocean every single day. 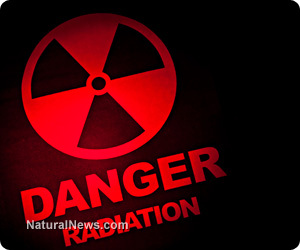 The Tokyo Electric Power Company (TEPCO) also admits that as much as 40 trillion becquerels of radioactive tritium have been released into the Pacific since the disaster began. Those who still say that the Chernobyl disaster was worse than Fukushima may also want to consider that a Woods Hole Oceanographic Institution study conducted in October 2011 concluded that Fukushima had already released up to 100 times more radiation into the environment than Chernobyl at that time. Today, this amount is likely astronomically higher, especially when you take into account all the airborne radioactive plumes that have been detected billowing across the ocean and over U.S. soil.